My wife and I have been on a couple of back to back trips in December, when the outside temperature in London dropped below zero degrees centigrade. We turn our heating off when we are away, so when we came back, the flat was at a balmy 7 degrees centigrade. Needless to say, it took a number of days to heat it back up to reasonable temperature. 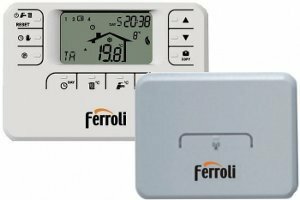 Since we already have a Ferroli boiler connected to a ROMEO W/RF (P/N: 013101XA) wireless OpenTherm thermostat, I've decided to try set it up to enable us to switch the heating on remotely. I asked Ferroli UK support to clarify the operation of these contacts, but they didn't know and referred me to the factory in Italy. At the time of writing, the factory has not come back to me. I did however stumble upon a hint on one of the forums on how to make this work, so if you have one of these thermostats and would like to set it up for remote control away from home, read on.. This guide assumes you have a working X10 stack already. 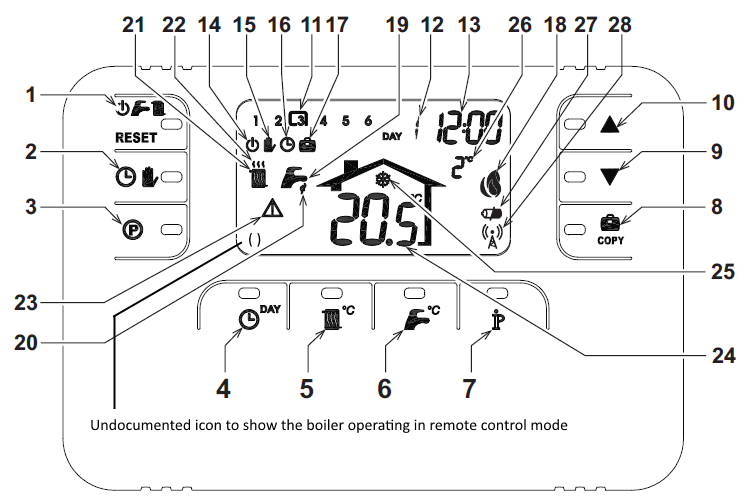 By default, the thermostat is configured to switch the boiler OFF when the "GSM" contacts on the ROMEO W/RF wireless bridge PCB are connected together and resume normal (daily/weekly programmed) operation when the contacts are disconnected. This guide assumes you are looking to switch your boiler ON instead, when the GSM contacts are connected together. Set P8 to 1 (1=Switch ON heating when GSM contacts are connected together) and also set P9 to desired temperature in this mode (e.g. 21.5C). This is the temperature the thermostat will try to maintain, while it is in the remote operation mode. Set the unit and house codes on the device using the two dials to match your X10 configuration. Set the slider on the left to "continuous" and the slider on the right to "relay only" (unless you want a bit of noise pollution). Connect a two-core wire between the GSM contacts on the ROMEO W/RF wireless bridge to the output relay contacts on the UM7206 (polarity doesn't matter) and plug the module into the mains. I used the same cable I used to wire up the external temperature compensator probe (1KWMA62U). Switch your boiler OFF using the ROMEO W/RF control panel, as you would normally do when you go away for long periods of time. The icon labelled #14 on the diagram of the RF remote control in the manual, should light up. Your boiler should now be in holiday mode (i.e. it won't switch ON according to your program, but will keep the temperature of the water in the pipes above 4-5C Celsius to prevent damage. Note, it may take up to 120 seconds for the boiler/thermostat to respond as the "GSM" contacts are changed, so please be patient. The boiler will work in this mode and maintain a constant temperature, set using register P9. Also, in this mode, the ROMEO remote control panel will not allow the temperature to be changed, until such time, that the GSM contacts are disconnected (i.e. you push the OFF button on the UM7206). That is about it. The UM7206 relay can be controlled using X10 commands from your X10 controller and if you have allowed access to it from the Internet, you can switch your boiler on remotely a day or so before you are due back from your holiday. That way you arrive at a warm house, instead of having to sit in your woollen hat and gloves nursing a cup of hot tea, while waiting for your dwelling to return to the habitable zone. When you do arrive back, don't forget to switch the boiler back into programmable mode by either pushing the OFF button on the Marmitek UM7206 or by issuing the appropriate X10 command via your interface. I choose to use X10 interface because I already have it up and running. If you don't want to use the X10 interface, there are a number of other ways to implement this remote switching capability. All you really need is a relay you can control with a computer, which is going to close/open the GSM contacts on the ROMEO wireless RF bridge. You can use a single channel USB relay module, plugged into a computer of your choice (e.g. Raspberry Pi) and as long as you can connect to your computer remotely, you can issue a command to control the connected relay from anywhere. However, regardless of the control implementation you choose, I would recommend to secure your control system using either a VPN and/or SSL with strong password. [n1] For some reason ROMEO W/RF is not available in the UK, but you can order it direct from eBay.it or from vendors in Italy/Poland/Russia. [n2] I use CM12U connected to Raspberry Pi running HEYU with domus.Link front-end.